a good time to talk to some psychologists who have shared our journey. 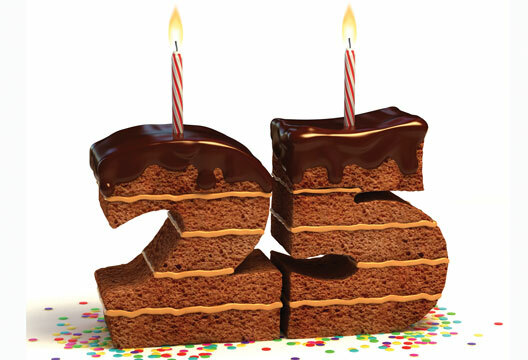 A call on our Twitter account (@psychmag) for 25-year-olds to share in our celebrations brought a good response, and I heard their stories about their first 25 years and what they think is in store for them and the discipline in the next. How did you get interested in psychology? Was studying psychology what you expected? What do you want to be doing in 25 years’ time? Alan has ‘no idea and wouldn’t like to guess’, and Kayleigh sees many possible avenues. Others want to be successful, and better at what they’ve set out to do. For Lucy the journey is important. Manpreet and Amy hope, among other things, to have achieved senior academic positions and to have published more in their areas of interest. Rebecca raises an issue that might be on a number of people’s minds: ‘In a more personal sense I think I’d like to have a family, and to be finally seeing the back of my student loan! That’s the ideal anyway.’ Perhaps Alan sums it up best: ‘As long as I’m happy that’s the important thing! What will psychology look like in 25 years’ time? Our respondents seemed to think long and hard about this question, and their answers are worth quoting in some detail. Alan, Susanna and Amy make much wider points which link to their views of how psychology will develop. Alan suggests: ‘We all use psychology without knowing it. I think everyone can benefit from thinking psychologically, not just those people who receive therapy or study psychology. Perhaps it should be taught in schools as a core subject? We learn about our bodies in primary schools. We are even made to take part in physical exercise to stay fit. Surely it is just as important to learn about and take care of our minds?’ Susanna sees the teaching implications of this: ‘Subjects are becoming increasingly cross-disciplinary, and psychology needs to respond to that. Psychologists work in a range of fields and it isn’t always appropriate to publish through psychological channels.’ For Amy, ‘If everyone had an understanding of why we all behave and think the way we do then perhaps we wouldn’t see so much conflict, violence, wars, poverty, etc. If we have any hope of breeding greater understanding and acceptance then the teaching of psychology should become part of everyday life and part of the school curriculum in every nation. How do you think the BPS ought to change in the future? Recognition of more applied subdivisions such as environmental psychology; giving more muscle to the profession; making it easier to maintain membership after a degree; and offering more free conference places to students for networking were some of the suggestions. It was even felt that more articles like this one, reflecting the views of younger and trainee psychologists, would help. But I’d like to quote Rebecca’s answer in full. Since it’s The Psychologist’s 25th birthday we also asked what the magazine meant to our 25-year-olds. Several of our pundits were apologetic that they were too busy to read anything more than material for their courses. But a number explained how The Psychologist had influenced them. Lucy finds she ‘skips to the book reviews first. I bought Psychosis: Stories of Recovery and Hope after reading about it and it was a very good read. I like the fact that recommended books are often memoirs of people’s experiences, or real-life case studies, which I find valuable in understanding more about mental illness.’ Amy saw ‘an advertisement for a post-graduate open evening at King’s College London Institute of Psychiatry. I decided to attend to see what their Neuroscience MSc was all about. I decided studying in London wasn’t for me but the course definitely was so I am now looking for the same course at other non-London institutions.’ Alan finds it ‘useful to read articles that aren’t in my area of speciality as it helps remove professional blinkers’. A special thank you to all the contributors for their enthusiastic and thoughtful answers to our questions. My path into employability was paved more by accident than design. Growing up, I was fascinated by offending behaviour and fancied that I would become a Criminal Profiler or Forensic Psychologist, and so I planned to gain relevant experience working with offenders. After graduation I applied for work in Local Authority secure units and Young Offender Institutes. I began in education as I had lost the battle for one of the few highly sought after Assistant Psychologist positions within Her Majesty’s Prisons. I resolved that getting a ‘foot in the door’ was beneficial as long as I made the most of every opportunity once inside. Education is compulsory for all young people in custody, and is not met with any joy by those who rejected their learning years ago. However, with nowhere else to go, education becomes a forum to explore skills, qualifications and experiences which pave the way for a crime free future. I moved from Learning Support Assistant to Information, Advice and Guidance Officer, ensuring that skills and qualifications gained in custody could be transferred and applied upon release. Without positive guidance and support, the inmates would quickly fall into old habits once the prison gates closed behind them. In many cases my best efforts failed, as I saw the same faces returning through the gates time and time again. For some, life in custody was an occupational hazard whilst for others, tragically, it was better than life ‘on the out’. I did not let it phase me; I gave the inmates the tools to succeed, it was up to them when to use them. Shortly after starting a Masters degree in Psychology, I was made redundant but quickly obtained an Assistant Psychologist post working in forensic psychology. I conducted psychological assessments of people involved in court proceedings and learnt a great deal about psychometric testing and formulation of client difficulties. Unfortunately after two years I was made redundant again and in my need to secure employment quickly I drew on my experience in custodial employability to obtain a role as an Employment Advisor at Remploy. Remploy is an organisation that was set up after the end of the Second World War to ensure that injured ex-servicemen had sustainable employment in factories. It is a company with an inspirational mission statement, ‘… to transform the lives of disabled people and those experiencing complex barriers to work by providing sustainable employment’. For more than 60 years, these factories have offered employment to people with disabilities and multiple barriers. Sadly these factories are no longer profitable and many of them are facing closure which will result in thousands of redundancies of people whose needs are so profound they are unlikely to find work again. Remploy have nationwide offices facilitating employment support under the auspices of the ‘Work Programme’ designed to work in partnership with the client to overcome initial barriers to employment and maintain support even after they find work. Those who have been unemployed for more than a year are referred to Remploy by the Job Centre. A recent quarterly employment review stated that there are 14,700 unfilled vacancies in a variety of fields including construction, retail, administration and hospitality in the Leeds, Bradford and Wakefield cluster. The imbalance between unfilled jobs and high rates of unemployment suggests that there is a lot more preventing people from working than simply a lack of job opportunities. Whilst some customers only require a few ‘tweaks’ to their CV and some interview practice, others have more complex needs, such as lack of work experience, no ambition, low confidence, low self esteem, substance misuse issues, physical, emotional and psychological health conditions. Minor difficulties can be effectively overcome by implementing some in-house support while more serious issues are referred to local specialised services. This means that each customer’s journey is unique, with no regimented markers to achieve. Whatever the variables, the outcome is the same – to support that person to a state of ‘work readiness’. Problems arise when customers consistently fail to attend their appointments, usually due to lack of motivation to work. Some people view the Job Seekers Allowance as an alternative to employment and ultimately their entitlement. This mentality can transcend generations, and it is then that I wish I had had further training in cognitive behavioural techniques to challenge their very rigid outlook. My background in psychology naturally guides my line of questioning towards exploring the causes of behaviour by understanding a person’s psychodynamic history. Whenever possible I try to apply theory to practice, particularly during interviews when I am conscious of the nature and direction of my questioning as well as paying attention to verbal and non verbal cues. I also draw on my skills as a reflective practitioner to evaluate my interactions and I use motivational techniques to encourage my customers to explore their ambitions and achieve their potential. I am keen to work with people who have complex mental health problems, substance misuse issues and criminal lifestyles. My natural instinct is to spend quality time with these people, exploring their issues and if appropriate conducting psychometric tests to inform my clinical judgment. However, a shortage of time, limited funding and a target driven market prevents this level of intervention. There are aspects of my job that are very interesting and the lives of many of my customers are fascinating. At Remploy I have the chance to gain an insight into a diverse client group, their lives and the impact of the current economic crisis. Any people-orientated role is enhanced by the principles learnt in studying psychology. All of my work experiences have provided an opportunity to use my knowledge of human behaviour. Yet my desire to pursue a career squarely within Psychology is undiminished. My work experiences have lead me to wish to learn more about mental health and I am now looking for research opportunities or doctoral training in clinical psychology.